Deer are a roving form of property. They cross estate borders as they migrate along seasonal paths, seeking higher ground in summer to evade bothersome flies, and woods in winter for shelter and food. The foundational principles of rewilding are, firstly, that deer and trees belong together, and secondly, that fear must be returned to the hill. Without an apex predator to bother them, deer graze so intensively that the few seedling trees to survive are twisty bonsai. There are tensions with sporting estates in regions of the Highlands where woodland remediation is being attempted by erecting fences or culling deer. Recently the difficulty of achieving ecologically benevolent agreements inspired—or provoked—Trees for Life to conceive Project Wolf, an innovative approach intended to overcome the impasse caused by the intransigence of neighbouring sporting estates. On their Dundreggan estate, in Glenmoriston, ecologist Doug Gilbert devised the project as an expedient in which humans fill the niche of the wolf, following the simple principle that if society refuses to accommodate real wolves then humandwolves must take their place. Humandwolf is my term for participants and my interest lies in this model of innovative thinking put into practice, blending hill thrills and ecology. Like many innovations, the concept arose from constraint—not being able to enforce a deer cull or establish enough fences—and focused on co-operation. The aristocratic pursuit of hunting is a thrill-seeking craze which disguises itself as ecological management. Humandwolving is an aesthetic and scientific experiment, an ethical practice that enacts human desires, a blend of tracking, stalking, and orienteering, all performed as a communal activity. Each April and May a pack of three humandwolves spend their nights, in particular the hours of dusk and dawn when the deer feed, out on the hill, hoping their presence—scent, noise, movement—will harry deer, protecting 150 hectares of seedlings and saplings. Although a lack of funding led to the experiment being temporarily abandoned, the head stalker at Dundreggan says that it works. There is little in common between the via activa of Project Wolf and Kairos Collective’s recent 3-day performance in association with the Dark Mountain Project, for which a pack of five actors dressed in panto-style wolf suits, following deer paths over the moor and displaying themselves for train passengers. Humandwolving isn’t concerned with animal mimicry—there’s no howling involved—rather it mimics the role of the wolf and the human encounter with wildness. In 2017 Richard Bracken and I made a den for humandwolves—he did the hard work of building and I helped with the thinking. It is a short walk from the Trees for Life volunteer centre at Dundreggan, and overlooks Creag a’ Mhadaidh, Wolf Crag, which informed its shape. I made a place-aware map of Dundreggan and commissioned Mhairi Law to document Project Wolf for a forthcoming book. The following poem was composed from answers to a questionnaire completed by humandwolves who volunteered in 2016 and 2017. The epigraph is from Lotte Brockbank’s adaptation of the folk-song, ‘Man of British Weather’. Project Wolf was conceived by Doug Gilbert of Trees for Life. Alec Finlay is an artist and poet. 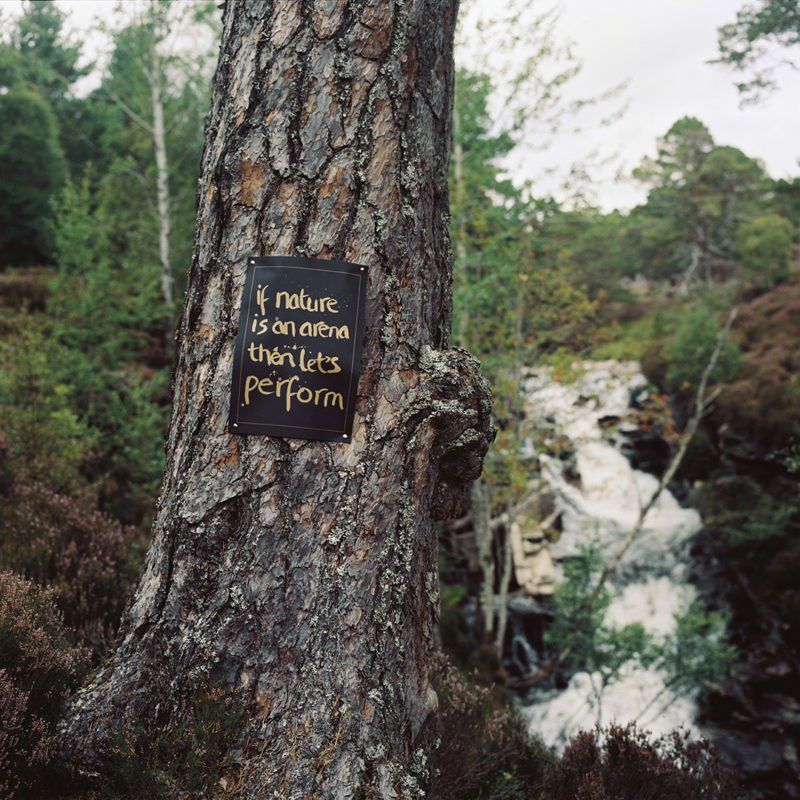 gathering, an ecopoetic guide to the Cairngorms was published by Hauser & Wirth in 2017, and an exhibition of the same title opens at Peacock Visual Arts, Aberdeen, 4 April - 18 May.